ExxonMobil 2009 | NOVA Cool Cats Special Hockey, Inc.
Coach Randy from the NOVA Cool Cats Special Hockey attended the ExxonMobil Employees Fair today, September 15th, 2009. It is the third year Coach Randy has been invited to the fair. The Cool Cats were invited to the fair when Susan Brooks donated $800 to the Cool Cats thru the employee’s payroll deduction. Susan is the mom of two of the Cool Cats past mentors. Susan loved the program because she seen how well it affected her sons. Susan wanted to give back to the program. The money raised by the employees is match by ExxonMobil. The matching is a great addition to this great program. The picture below shows Coach Randy sitting at the table. It was just the opposite the four hours during the event today. 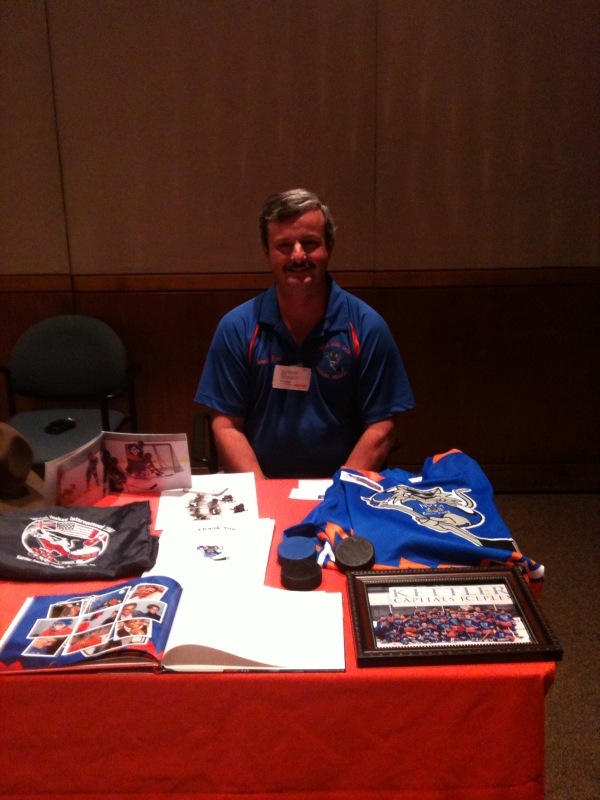 Coach Randy was standing beside the table handing out flyers of the Cool Cats program. All of the employees loved the program. A lot of the employees asked various questions to learn more about the program. Coach Randy loved answering all of the great questions about the Cool Cats. A mentor from the Cool Cats Rob Tracy is an employee of ExxonMobil. He was at the employee fair. He promoted the Cool Cats because he has experienced the Cool Cats first hand. Rob has been a mentor with his young son. They both are a great asset to the mentoring program for the Cool Cats. Rob may be in trouble now because Coach Randy referees Rob’s men’s league team at the Ashburn Ice House. Randy met some of Rob’s co-workers. Rob better behave now? One other employee gave the Cool Cats his hockey equipment last year. We thank you Jonathan for giving us the equipment. It was great to visit other tables at the event. I met Kris from National Osteoporosis Foundation. Kris plays hockey at Fairfax Ice Arena. She may help mentor the Cool Cats? I share the table with the Boys Club of American. We looked up the badge a Boy Scout can earn to learn ice hockey skills. Michele and I talked about maybe getting some Boy Scouts out to help with the Cool Cats. The Cool Cats have helped Scouting because one scout got his Eagle Badge by running the Cool Cats Golf Tournament. Arianna got her Silver Award thru Girl Scouts by running our hockey Camp in 2008. I personally want to thank all of the people who made this event possible. Thank you, Kim for stopping by the table. Thanks to Judy Hubka for helping all of the vendors to get set up for the fair. It is great to make all of the new friends today. The only question I have is what is the date next year?